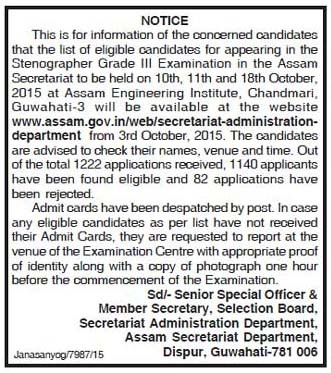 www.assam.gov.in/web/secretariat-administration-department from 3rd October, 2015; The Candidates are advised to check their names, venue and time. Out of the total 1222 applications received, 1140 applicants have been found eligible and 82 applications have been rejected. Admit cards have been dispatched by post. In case any eligible candidates as per list have not received their Admit Cards, they are requested to report at the venue to the Examination Centre with appropriate proof of identity along with a copy of photograph one hour before the commencement of the Examination.